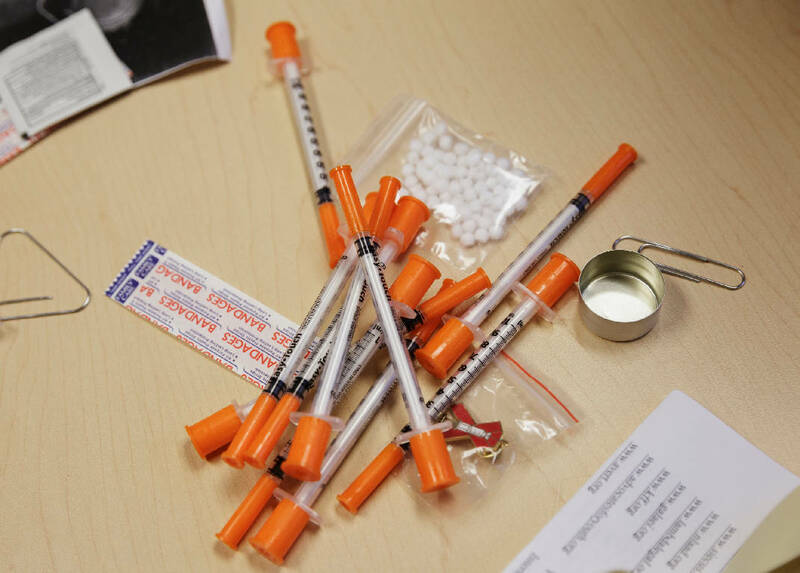 POLL: Do syringe exchange programs help fight drug abuse? A nonprofit organization operating in Hamilton County since 1986 has rolled out a new program intended to combat drug use by offering clean needles and education to men and women caught up in substance abuse. Chattanooga CARES, the Council on AIDS, Resources, Education and Support, started the Syringe Trade and Education Program of Tennessee just a few weeks ago. The program already has taken about 100 dirty needles off the street in the first syringe exchange program to get up and running in Hamilton County. The program operates on a one-to-one exchange — every dirty needle handed over nets its owner a new, clean needle. Clients also receive access to simple medical supplies such as alcohol swabs, bandages and medical testing for HIV and Hepatitis C, both of which can be transmitted via contaminated needles. Director of development and communication Cory Howard takes out a sharps container that houses a syringe exchange kit at Chattanooga CARES on Friday, April 6, 2018, in Chattanooga, Tenn. Chattanooga CARES has implemented the city's first syringe exchange program, which provides clean syringes in exchange for used needles in an effort to reduce HIV and hepatitis infections among intravenous drug users. "A lot of people think that we're enabling people to use drugs, but that's not the case. People who are in these programs are five times more likely to actually get into treatment, and you can also see an 11 percent reduction in crime," said Cory Howard, director of development and communications for Chattanooga CARES. "At the end of the day, because it's an addiction, people are going to shoot up," he said. "We're there to reduce the damage." He said the program is made possible by funding from the Tennessee Department of Health that pays for the staffing and a two-year grant from AIDS United that covered the cost of the materials they dispense. Those resources go straight to people who will likely turn around and use again, but the program isn't intended to shame or strong-arm clients. Instead, the goal is to build relationships and prevent the spread of deadly diseases in the meantime. "They're building a relationship with someone, a professional, who can give them access to those resources," he said. "If the day or week comes where it becomes too much and they're ready to take that step into treatment, instead of being lost, they have someone that they can immediately go to." The syringe exchange program also backing from the Chattanooga Police Department. "I support the STEP TN program because it connects drug users with people who work with them on disease prevention and possibly treatment," Chattanooga police Chief David Roddy said. "The program also helps prevent Chattanooga police officers and vulnerable community members from injuries and diseases that can stem from dirty needle sticks." Melanie Connatser, rural health coordinator for Chattanooga CARES and head of the syringe exchange program, said they've helped more than a dozen people in the first three weeks. The community response has been positive, she said, but the agency is trying to reach more people by word of mouth about the resources it offers including samples of naloxone nasal spray, a drug that can counteract overdoses. "We provide them information about overdoses, we provide naloxone training and we give them naloxone on their first visit. As far as our resources, we provide them education about HIV and Hep C as well as treatment centers here locally for them to utilize as well," she said. She said the nonprofit is also looking to expand the scope of its services by rolling out a new mobile unit in the coming months that could carry the needle exchange program into more rural parts of Southeast Tennessee. Connatser said she came to Chattanooga CARES because she wants to ensure people in those areas get the help they desperately need in fighting drug abuse. 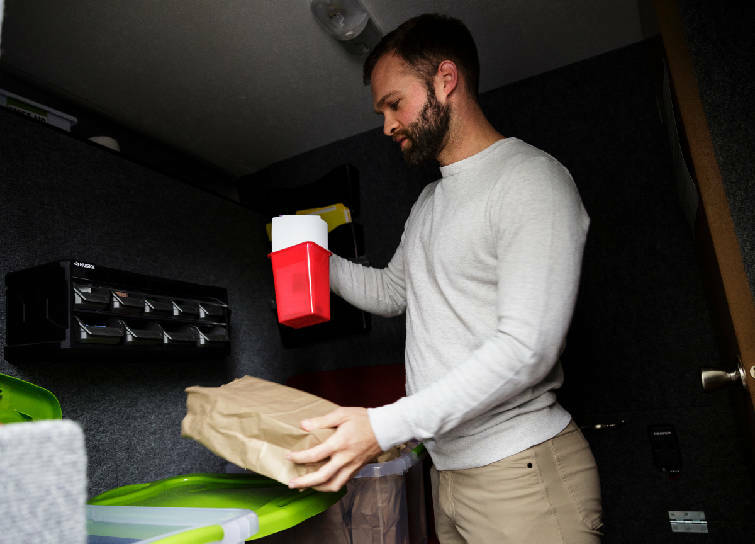 "If a user decides to use, they're going to use no matter what, but if we can make it safer for that individual to practice that safely and get contaminated needles off of the streets, that is safety for our communities," she said. "And of course we want to reduce the spread of HIV and Hep C, so that alone is usually what I tell people. If we can help eliminate that or reduce it, it's a major, major opportunity for us." New syringes are available at Chattanooga CARES' office at 1000 East 3rd Street.